The notable and mostly sought after, grape of Nemea. It gives wines with beautiful dark red colour and rich velvety taste. White grape with aromas of flowers cultivated mostly in Santorini and the Aegean islands. This white grape variety is the most important grape of Santorini and it has been successfully planted in Halkidiki, Epanomi, Drama, Pangeon and the Peloponnese. It has high levels of acidity, even when fully mature. Different white grapes (Santameriana, White Volitsa, Migdali, Brena), cultivated in the Peloponnese under this common name. A white grape widely distributed in the southern Aegean islands and Halkidiki. Its wines have a delicate lemony aroma and rich taste. Red grape originating from the island of Zakinthos and the coast of western Peloponnese. A red grape variety cultivated at the Ioannina area in Epirus. One of the oldest indigenous white varieties of Crete, with aromas of Bay Laurel, "dafni" in Greek, hence its name. This white grape from Epirus shows great potential regarding the production of fresh, dry and sparkling wines. Cretan red grape. It gives wines with high alcohol content, soft and spicy. It is usually vinified together with Mandilaria. One of the rare varieties from Lakonia, Peloponnese together wih Monemvasia, Petrouliano and Thrapsa. Its distinct aroma reminds of quince jam, hence its name (‘kidoni" means quince). A red grape cultivated exclusively in Rapsani, Olympus and a component in this region's V.Q.P.R.D Rapsani. A grape with notable fruit and vivid acidity, cultivated in the northern Pelponnese and the Ionian islands. Exclusively Cretan vine, one of the most ancient Greek varieties. A grape with potential, that shows its quality character when mature enough. This red grape is an ancient variety indigenous to the island of Limnos. The "Limnia ambelos" (Limnos grape) as it was called in antiquity was widely praised by ancient writers. Today it is cultivated in northern Greece as well. Red grape from the Aegean Sea. It is usually vinified together with other varieties, that tame its difficult character and add finesse to its earthy aromas (as Monemvasia in the island of Paros and Kotsifali in Crete). The red variety from Santorini. One out of many unknown grapes of the vineyards of Cyclades, that survived thanks to the constant efforts of the vintners. It gives wines with character and intensity. A large family of grapes! Many grapes from the Perloponnese, Epirus, Macedonia and Central Greece bear this name. Their common characteristic is the black colour of the skin. A grape with tannins that gives wines apt to ageing in the barrel. White grape cultivated in the island of Paros. Cultivated in the Mantinia plateau and in southern Peloponnese to produce white wines with intense and distinct aromas of Muscat, rose, peppermint and lemon. A fine white variety, that gives rich and aromatic wines. The famous aromatic grape cultivated in vineyards in Patra and Cefalonia. Most Mavrodafni grapes are used for the production of the highly graded, aged, red sweet wine carrying the same name. A grand and famous grape family (Muscat) cultivated under various names in almost every winemaking country. Moschato produces a vast variety of wines, from aged, sweet wines to fresh, fruity, sparkling wines. Their impressive aroma stands out. A red aromatic variety cultivated in Kozani. A red grape cultivated exclusively in Goumenissa and part of the makeup of the area's V.Q.P.R.D. wines, to which it brings fruity taste, color, and alcoholic content while softening acidity levels. Indigenous Cretan variety, revived thanks to the efforts of the local vintners. It gives wines with a light lemony taste. White grape, one of the most elegant Greek varieties. Cultivated in the island of Cefalonia and in Central Greece, it gives fresh wines with a lemony taste. It is cultivated almost everywhere in Greece. When cultivated and produced with care, its wines are light and easy to drink, with a nice fruity taste. The most widely distributed grape in the Greek vineyard. It is cultivated mainly in Attica and the rest of Central Greece. 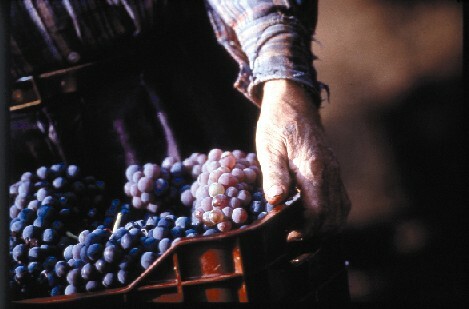 Together with Roditis, it is one of the main grapes for the production of retsina. A grape with rosy skin and crisp acidity. Cultivated throughout the Peloponnese and sparsely in Central Greece and Evia. A red grape cultivated exclusively in Rapsani, and part of the makeup of the V.Q.P.R.D Rapsani. Red grape, cultivated solely in the island of Lefkada, to give wines with intense colour. Old Cretan variety. A white grape that gives pleasant wines with aromas of flowers and fruit, when carefully cultivated. Red grape cultivated at the Ioannina area in Epirus. The most distinguished red variety of Northern Greece. It manages well in continental climates, and it is cultivated in more regions than any other variety in Greece. Its grapes have an intensely acidic taste, even when mature.